They’re shaped like a small courier bag, with the addition of really well-thought-out outside pockets. The bag’s charms are those pockets, it’s toughness and comfort — they’re designed for cops. The bailout bag measures approximately 14 by 10 by 6 inches, which makes it not quite big enough for a full-size laptop or clipboard, says Mr. Coupe. It comes in olive drab, black, desert sage, and coyote brown. The $40 price tag looks nice too. The inside is lined with a Velcro-like “loop” fabric, which means anything you stick in there with the other half of the Velcro pair is going to stay in place. That’s a very nice feature. 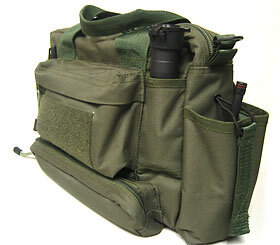 One reviewer (of a slightly earlier model, Mr. Coupe informs us) suggests taking advantage of this by hooking tactical-gear style compartments to the lining — if eleven pockets for specific gadgets like pagers, digital cameras, index cards, and handheld organizers on the exterior just aren’t enough for you. probably the two end pockets — these can carry a thermos or mineral water bottle without risking coffee or water leaking onto a subnotebook, but when they’re not needed can be pulled tight against the sides by lanyards. They’re good for carrying the sort of anorak that folds into a pouch, too. The black bag I have looks much nicer in real life than they do in the photos in the links above — less “CHIPs” and more Matrix. The construction quality is phenomenal — zippers and studs are extra tough but very smooth working and a heavy “military” sound to their operation — making you feel so un-girly, even though you’re carrying a handbag. Got a favorite “un-girly” man purse you’d like to see featured on the Satchel Pages? Let us know about it. This entry was posted on Wednesday, May 10th, 2006 at 2:10 pm	and is filed under Bag Contents, Courier Bags, Details, Gadget Bags, Law Enforcement Gear, Man Bags, Manufacturers. You can follow any responses to this entry through the RSS 2.0 feed. You can leave a response, or trackback from your own site.